He was born in Guadalajara in 1886, and he studied engineering and military aviation. At the same time he developed his creativity in experimental photography. 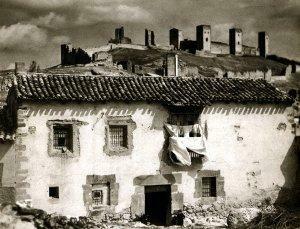 He was without question the most important representative of Spanish photo-pictorialism. He developed this technique and followed it devoutly until his last days as a photographer. But his scientific spirit outbalanced his interest for photographic reactions and components, as he took interest in reviving the country’s economical development, promoting the creation of plane and car industries. His photograph creations were known in Spain, Europe and The United States due to the publication of his collections in interesting volumes like España Mística (Mystical Spain), España: Tipos y Trajes (Spain: People and Costumes), España: Pueblos y Paisajes (Spain: Towns and Landscapes) or España: Castillos y Alcázares (Spain: Castles and Fortresses).